After falling in love with that chest yesterday at Hobby Lobby, Vince was determined to find one for me that was built a little better. What I have now is an end table (that matches my coffee table that we don’t have room for in the living room so it’s in storage), my recliner and a floor lamp. The end table is where I put my notebook, tablets, water and everything else .. trust me . . EVERYTHING ends up on that table. But, it has one shallow drawer and in that drawer is where is more EVERYTHING! Nail file, clippers, lotion, knitting paraphernalia, notecards, pens . . it’s overflowing. Vince didn’t like the way the one at Hobby Lobby was built and he said, and he was right, that I couldn’t put my notebook and tablet on it because it’s too tall. He was on a mission to find me a better chest and he found this one at Walmart. I has good ratings and in the ratings, folks said it was well built. I’m going to have it sitting back against the wall and since it isn’t nearly as deep as the end table, I still won’t be able to reach over and place or remove the notebook/tablet. Then I started thinking . . what if I move the floor lamp from the left side of my chair to the right side of the chair and get this little end table to put on the left side of my chair. Perfect! It has way more storage than does the end table I currently have and it’s smaller and takes up less room. I’ll be able to put my computer gizmos on top, as well as my water. I may ask Vince to drill through the back of that drawer/cabinet so I can make the drawer a charging area for the phone, tablets, etc. without having cords hanging out everywhere. 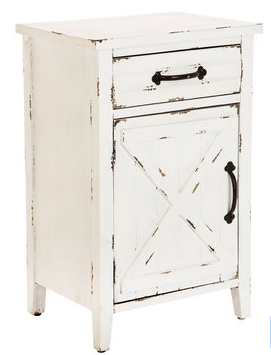 When/if we leave here, the little end table would be great for an extra bedroom and the chest would always work in a sewing room if it doesn’t work in a living room or dining area. I think about how much we used to spend on furniture but after a couple of moves, I realized buying expensive furniture resulted in grief when moving. Our bedroom furniture, that I really love, came from Target about 10 years ago and it’s great. The guest room furniture came from Big Lots and I love it. With the end table and chest, I’ll have furniture from Walmart and Hobby Lobby and those two pieces will probably be my most favorite of everything! The chest is supposed to be here Friday. Vince has to go to town today (two days in a row <G>) because he’s getting a haircut so he will run by Hobby Lobby and see if they have that end table. Once it’s all setup, I’ll post a picture. Love the chest of drawers, too. Was it online? I haven’t found it. 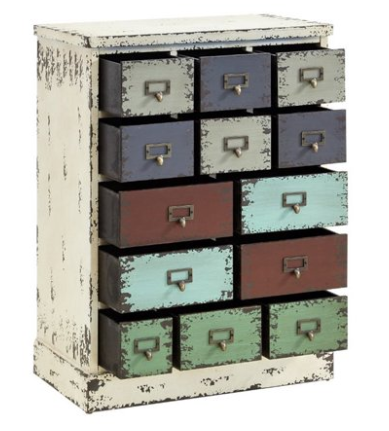 Try searching for Powell Parcel Collection Cabinet with 13-drawers, multi-color. We’re former military people and know all about how bad moving is to furniture, etc. My very first sewing machine (given to me by grandma for hs graduation) was totally destroyed. Funny you should mention Big Lots. I’m going tomorrow in search of a new couch for our sun room. They have some good stuff. I wish we had a Hobby Lobby nearby . We just got our Hobby Lobby last summer and I’m so happy to have it. I love your choices!! Good job.. I really like these! I did read some of the comments on the other one and it said that it was cheaply built and not built very well. I guess sometimes you get what you pay for!! Those are going to be great! I may have to look at our Walmart, because it drives me crazy having everything on my end table, and then the Kleenex box falls of or things are stacked and I can’t find what I want. It does open up and have a box inside, but with stuff on the top, I can’t really get to it. It has a magazine rack on the side with crazy quilting books, and I do like that convenience. But that little drawer thing is very enticing! Wayfair has so many choices and very good prices. Looks like the perfect solution. I have a similar cabinet next to where I knit. It has the drawer and instead of the door below on yours, mine is open with a shelf in the middle so it’s two separate sections on the bottom. Someone from my apartment building had put it out by the trash and I rescued it and painted it. It’s the perfect little piece. Can Vince send me the link for that chest? Having trouble finding it on the Walmart site. Thank you!